64-year-old Reykjavík Detective Inspector Hulda Hermannsdóttir knows retirement looms, but she’s shocked when her boss accelerates the timing. She’s got two weeks to wrap things up, after all, he’s already given her office and caseload to a younger, male colleague. To appease her, he tells her she can look into a cold case of her choosing during her final days at the force. Hulda immediately knows which case to revisit—the death of a Russian immigrant found in a remote Icelandic cove. The case was ruled a suicide, subsequently closed and forgotten. She quickly realizes her colleague botched the investigation… his sloppy surface work did nothing to get to the truth of what really happened to Elena. The more Hulda digs, the more she’s certain Elena was murdered. Everyone seems to dismiss the case, however, and as the clock races, she’s pressured to let it all go. But Hulda knows she’s close, and her tenacity leads her to the very truth she sought, a secret far more dangerous than she expected. With the dark, desolate backdrop of the cold Icelandic wild, Ragnar Jónasson narrative unravels beautifully. It’s a slow-burning story punctuated by a strong, female heroine with secrets of her own. Her anger at being consistently excluded, overlooked and subsequently pushed out as a woman resonates. But I love her sheer doggedness at solving the case, and fighting those who seek to freeze her out. As with his Ari Thor series, the story really comes to life vividly with his description of Iceland’s more insolated, unforgiving landscapes. It’s easy to imagine the wickedness that could hide in its snow-covered slopes. 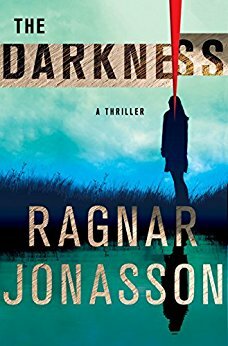 The bleak atmospheric tone it breeds adds so much to an already well-crafted mystery, making Jónasson’s novels truly stand out from the bunch. The Darkness ends with a phenomenal, unexpected twist that will leave you breathless, and I can’t wait to see how this series continues.